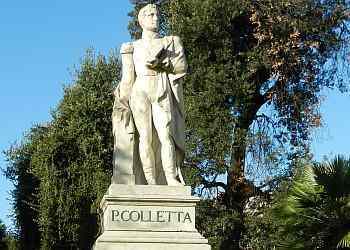 There is a prominent monument to Pietro Colletta in the Villa Comunale (photo). Indeed, he was in a good position to provide information on the turbulent years of the 1790s, the short-lived Neapolitan Republic, the reign of Murat in Naples, the restoration of the Bourbons, etc. etc. Indeed, many of the anecdotes about Naples from those years, recounted by such as Alexander Dumas in The Bourbons of Naples are taken from Colletta's earlier work entitled Storia del Reame di Napoli [History of the Kingdom of Naples] first published in 1834 by Presso Baudry in Paris. Colletta was born in Naples. He was an artillery officer cadet in the Neapolitan army in the 1798 campaign against the French Revolutionary army. (The Kingdom of Naples was part of the Second Coalition against Revolutionary France.) During the 1798 campaign, Naples captured the French client Roman Republic but was forced to withdraw by the end of the year. The French followed the Neapolitans back to Naples and bided their time outside the city, their presence being the direct cause of the flight of the Bourbon royal family to Sicily and a sign to home-grown Neapolitan republicans to declare the Neapolitan Republic in January of 1799. Colletta served the new Republic but was arrested before the year was out when the republic fell to the reconquering army of Cardinal Ruffo. Colletta was tried for treason along with many others but escaped execution, according to some sources, by bribing officials. He became a civil engineer until 1806 when the French returned in force and seized the kingdom of Naples again, first installing Napoleon's brother, Joseph, and then, Napoleon's brother-in-law, Gioacchino Murat, on the throne. Colletta rose again in the ranks of the army under the new French client state of Naples. He served in campaigns against banditry in the south, the 1808 campaign to drive the British from Capri, was a military commissioner in Calabria and the Director of the Department for Roads and Bridges for the kingdom. He was made a baron by Murat and as a general fought against the Austrians at the battle of Panaro, a minor battle in the so-called "Neapolitan War". It was an empty victory since Murat ultimately was forced to abdicate after the final defeat of Napoleon. Colletta had helped broker the final Neapolitan surrender to Austrian forces and signed for the Kingdom of Naples at the Treat of Casalanza, the terms of which called for the return of the Bourbons to the throne of Naples. On the restoration of Ferdinand, Colletta was permitted to retain his rank in the army but became involved in pro-constitutionalist agitation against the Bourbon autocracy. He was exiled and permitted to settle in Florence where he spent the rest of his days engaged in writing his Storia del reame di Napoli. That History was long considered the standard work on the Bourbons of Naples from the beginning (1734) until Colletta's own demise. It is, however, an extremely bitter denunciation of the Bourbons and no doubt fed the flames of the early risorgimento, the passionate movement to unite the entire peninsula into a single nation.